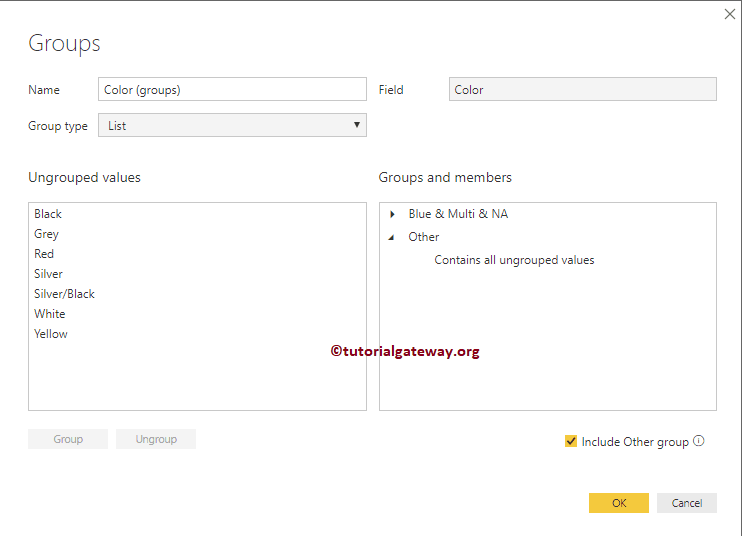 Power BI Grouping is the process of combining or merging two or more values for further analysis. For example, When we are seeing products by category report, we may find very few records (unnoticeable products). Sometimes, it may be annoying to see all those underperforming products. 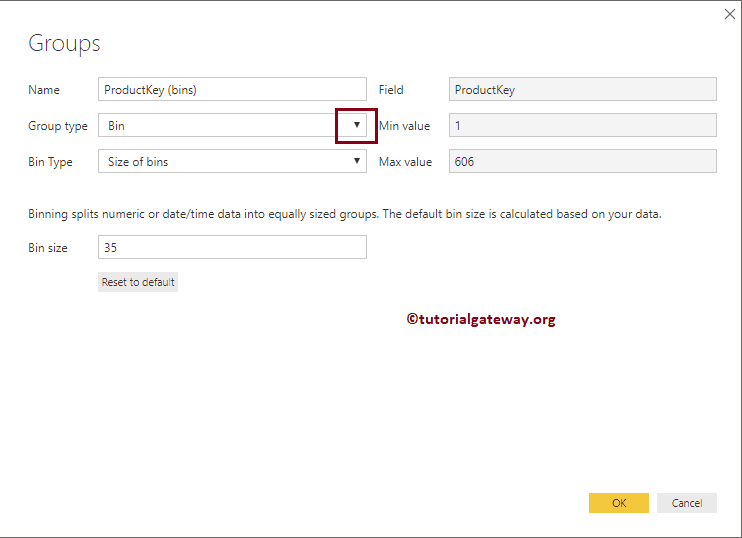 In this situation, you can create a group by combining those records, and display it as one product. 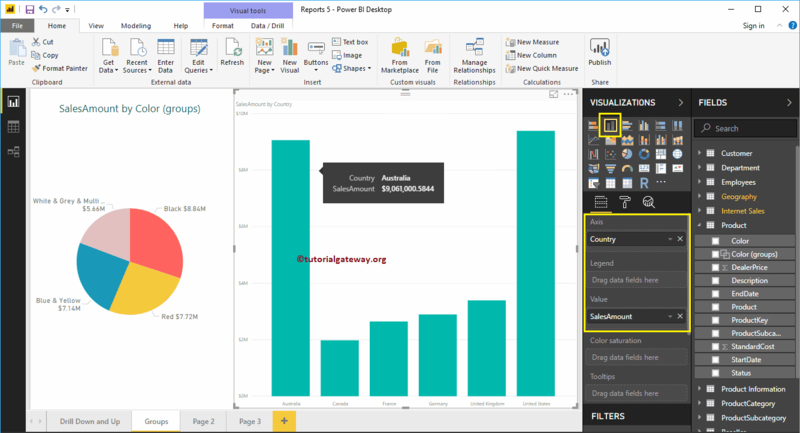 For this Power BI groups demonstration, we are going to use the SQL Data Source that we created in our previous article. 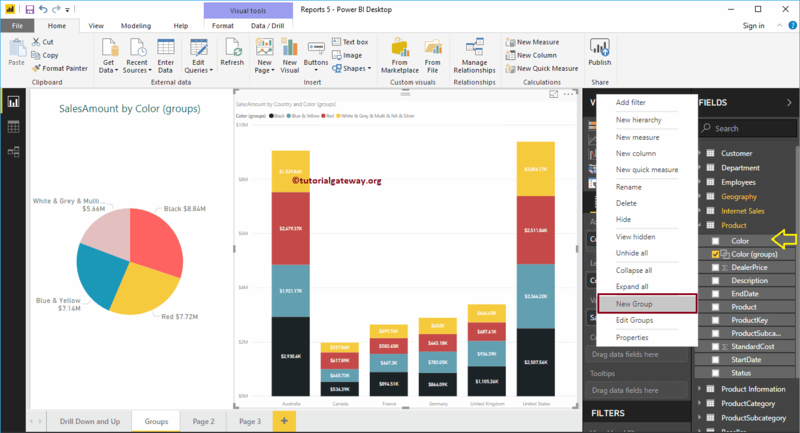 So, Please refer Connect to SQL Server article to understand the Data Source. 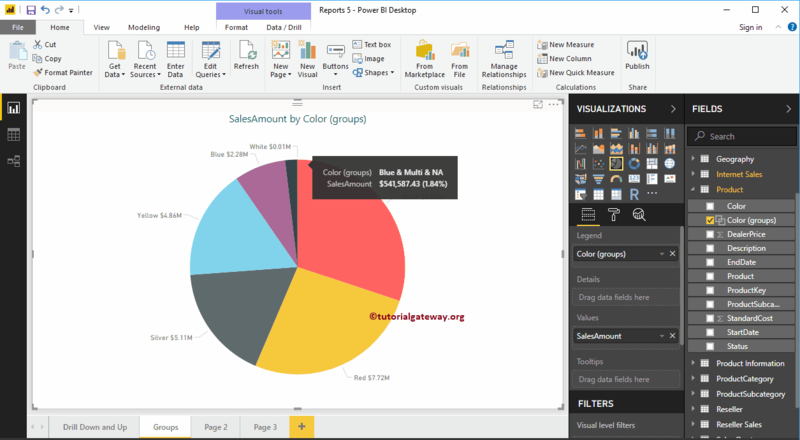 To visually demonstrate this Power BI grouping technique, we will create a Pie chart. 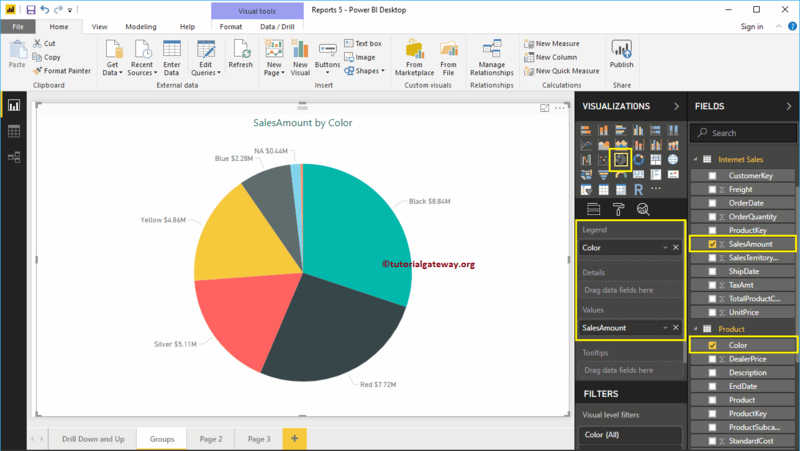 As you can see from the below screenshot, we created a Pie chart by dragging the Sales Amount column to Values field, and Color to Legend region. 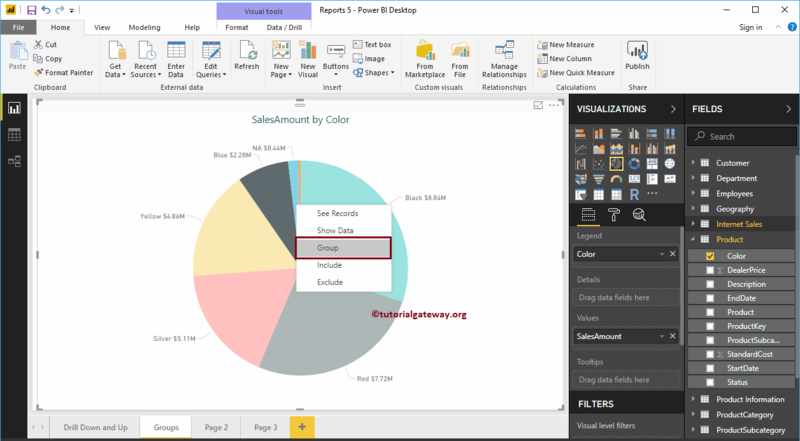 NOTE: I suggest you to refer Create a Pie Chart, and Format Pie Chart article to understand the steps involved in creating, and formatting a pie chart. 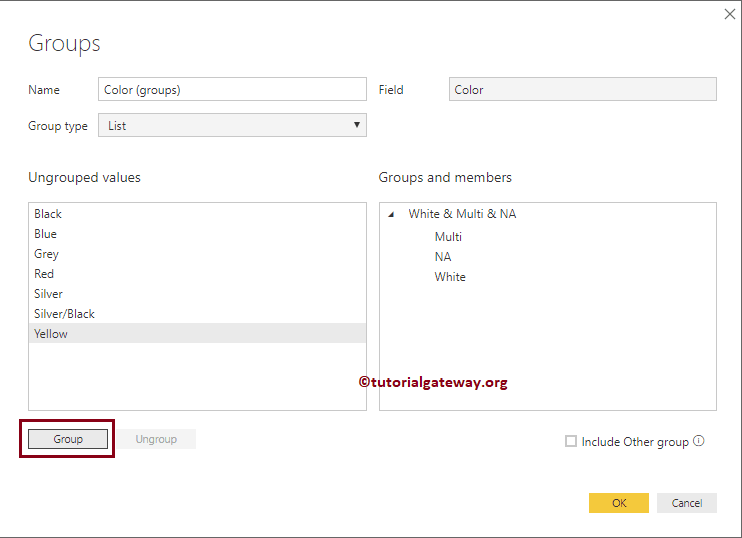 To perform grouping in Power BI, Please select the fields that you want to group, and right-click on it will open the context menu. Please select Group option from the menu. 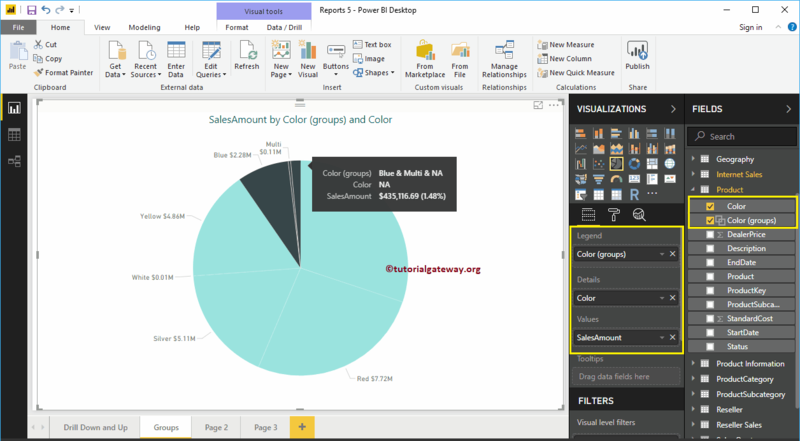 Once you Click on the Group option, Power BI will automatically group those items as shown below. That’s it, we did the grouping. 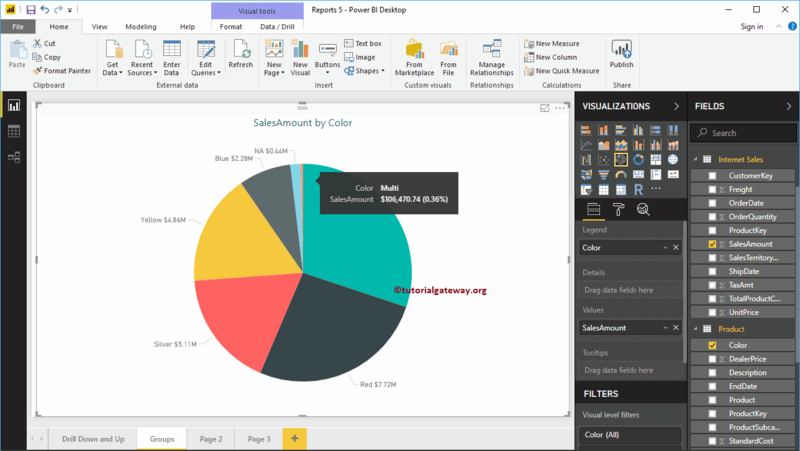 If you observe closely, Legend section is replaced by Color group, and the color is placed in the details section. 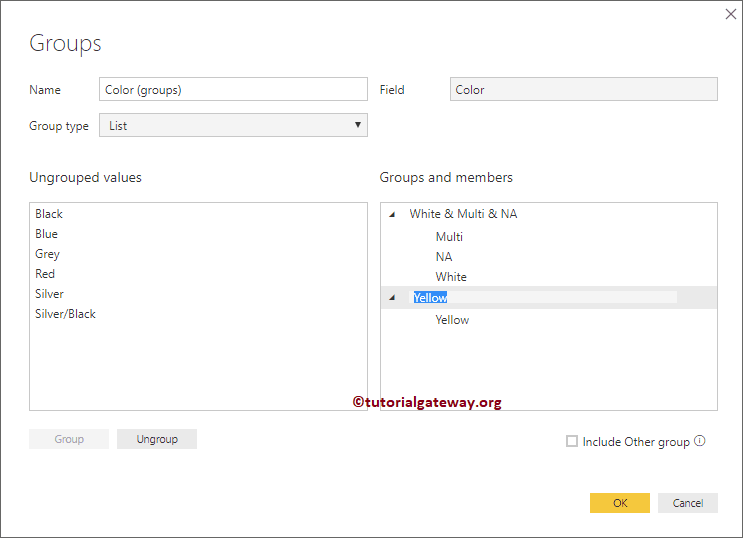 TIP: By default, Power BI Group option will group the selected items as one group and remaining options as another group. Let me remove the Color field from the Details section. 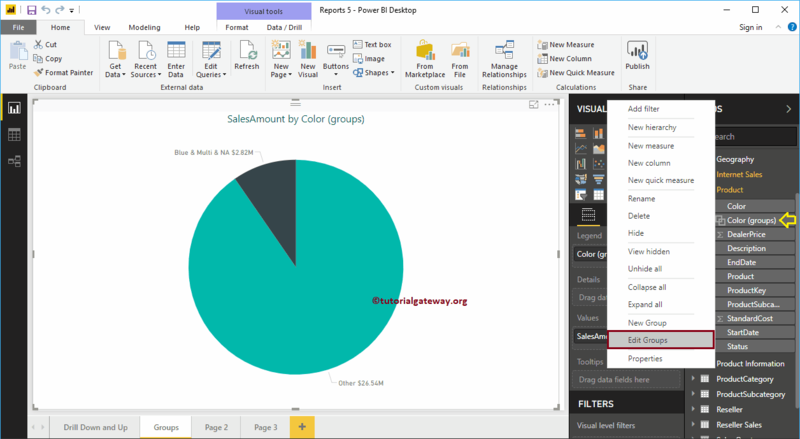 Now you can see only two partitions in the Pie chart: one contains Blue, White and NA colours, and the second partition contains remaining colours. Clicking the Edit Groups option will open the following window. Group Type: List (group) or bin. 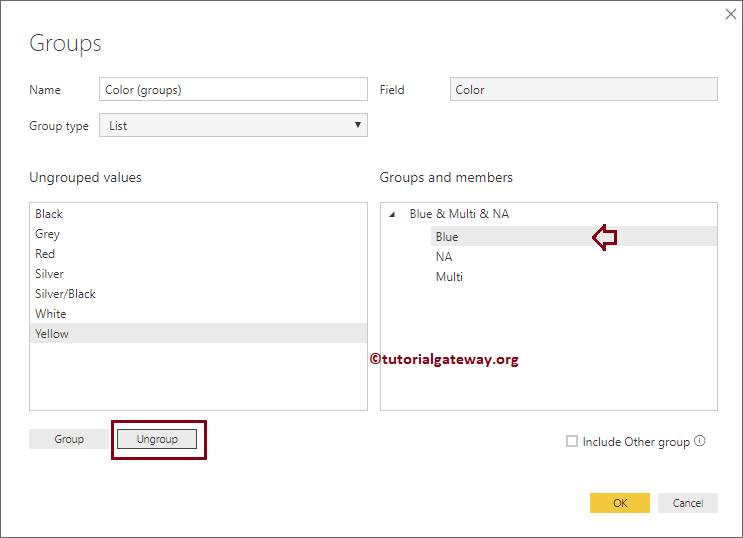 Ungrouped values: Fields that are not grouped but available in this column. Groups and Members: List of groups, and their members. 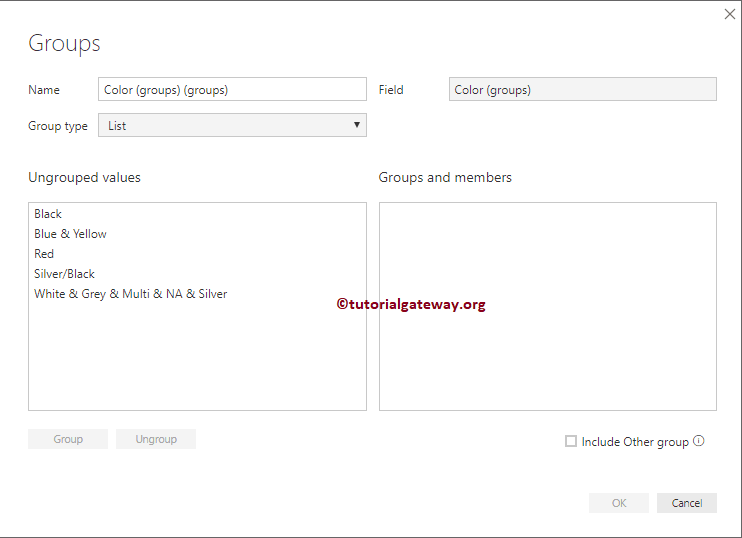 Include Other Group: Do you want to place all the ungrouped members in the Other group. If so, checkmark this option. 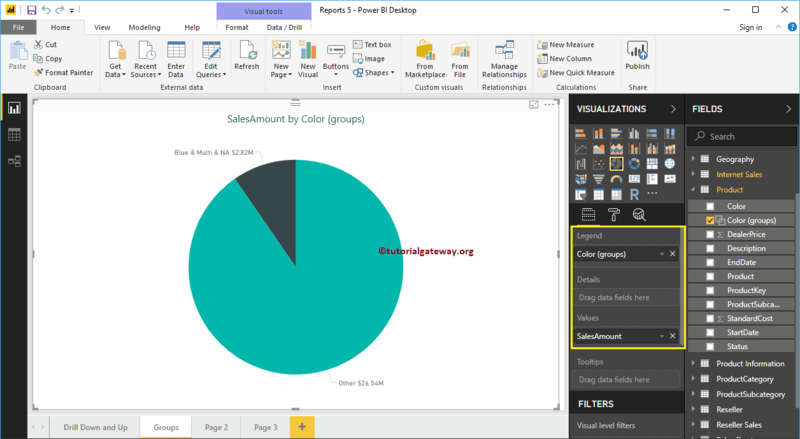 Now you can see the pie chart that is displaying all the colours, and one group that contains Blue, Multi and NA colours. 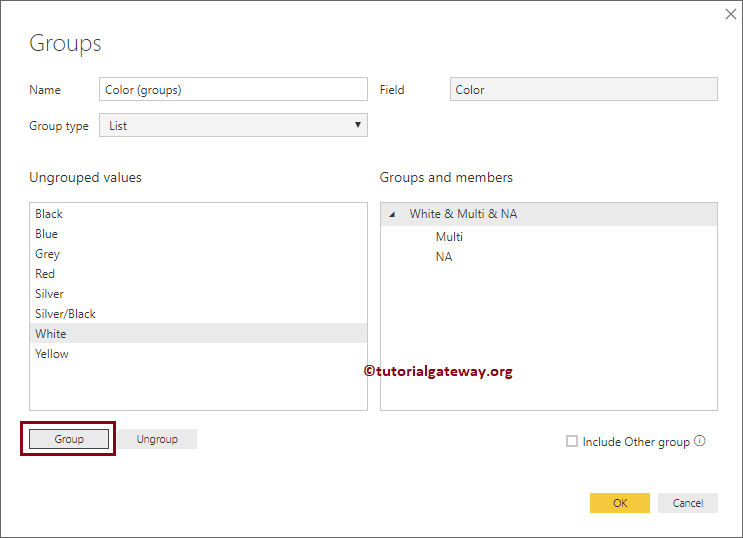 To remove Power Bi group members, Please select the group member that you want to remove, and click ungroup button. For the demo purpose, we are removing the Blue colour. 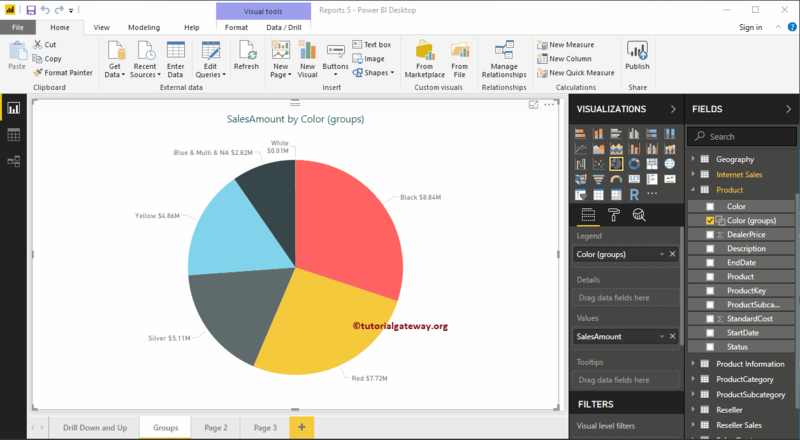 And our pie chart is displaying all the colours, and one group that contains Multi and NA colours. From the below screenshot, you can see that the group name is renamed. 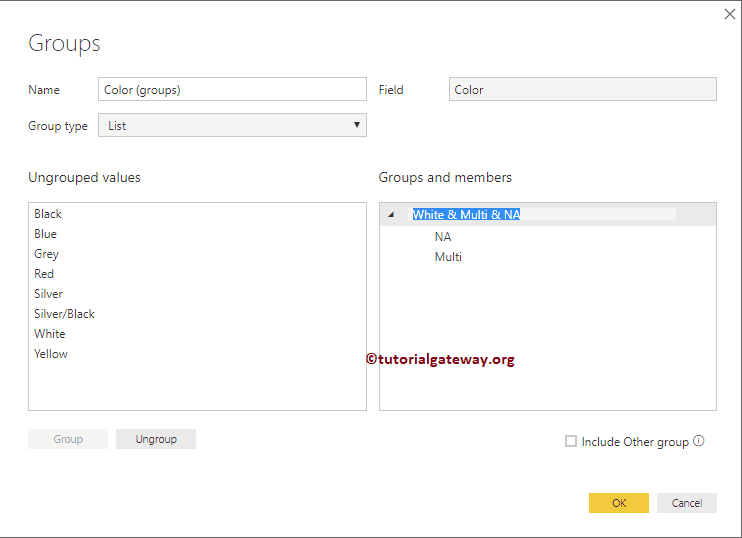 Please select the group member that you want to add, and select the group as well. Next, click on the Group button. 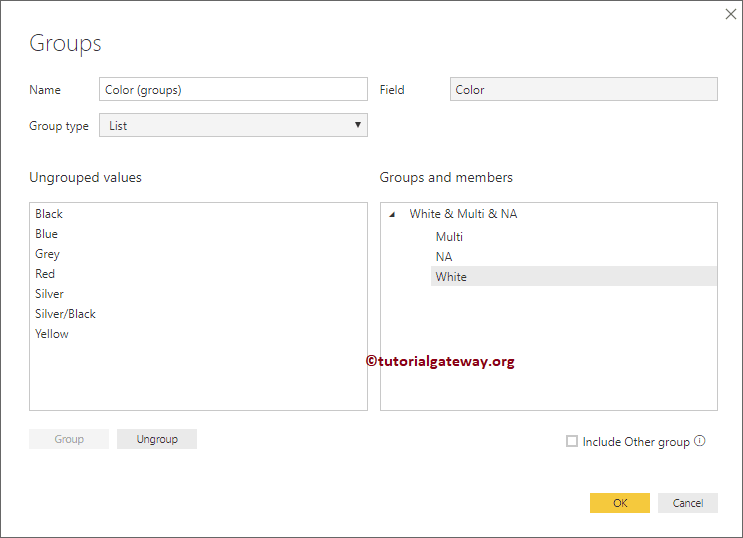 For the demo purpose, we are adding White colour to an existing group. 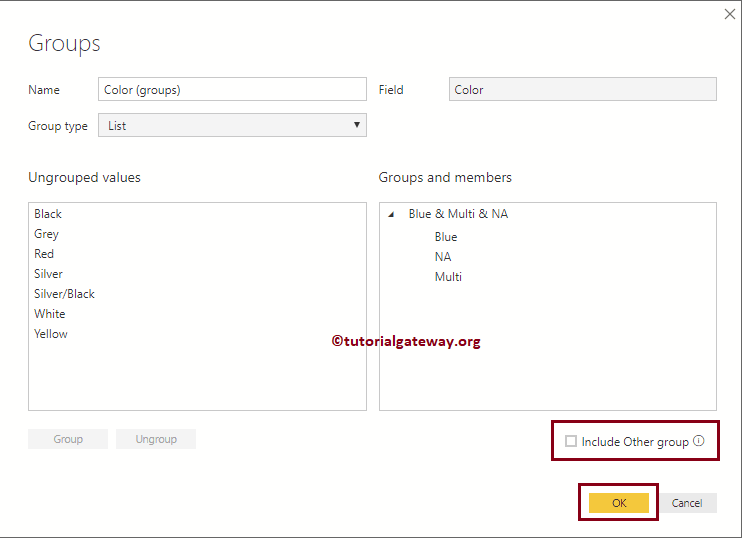 Please select the field for which you want to create a group, and click the group button. For the demo purpose, we are selecting the Yellow colour. Now you can see the new group. 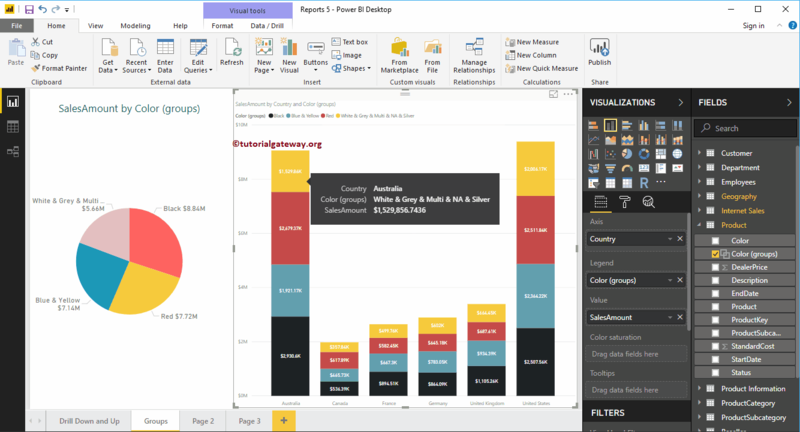 Once you created a Group in Power BI, it will act like any other column or fields. So, you can use it in N number of charts. 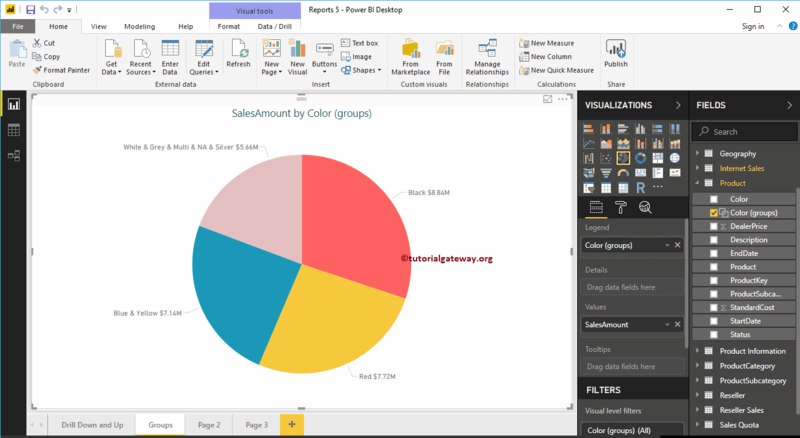 To demonstrate the same, we created a Column chart that shows the Country wise sales. Next, we added the Color group in the legend section. 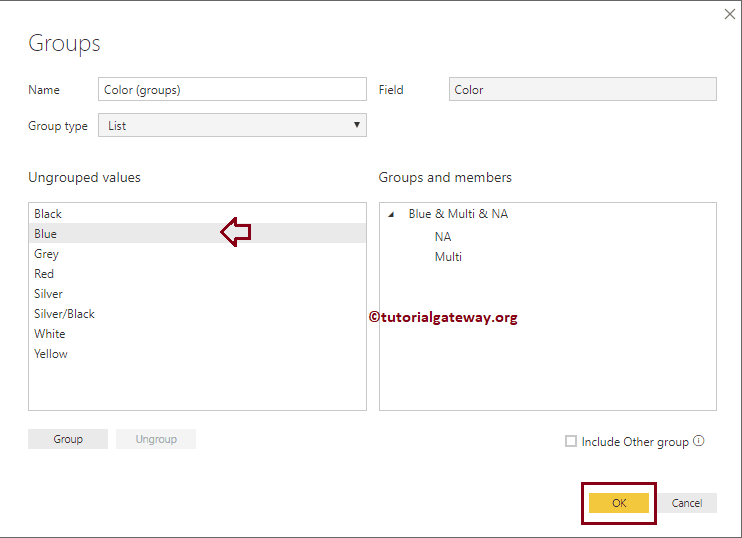 Please select the filed that you want to use as a group, and right-click on it will open the context menu. 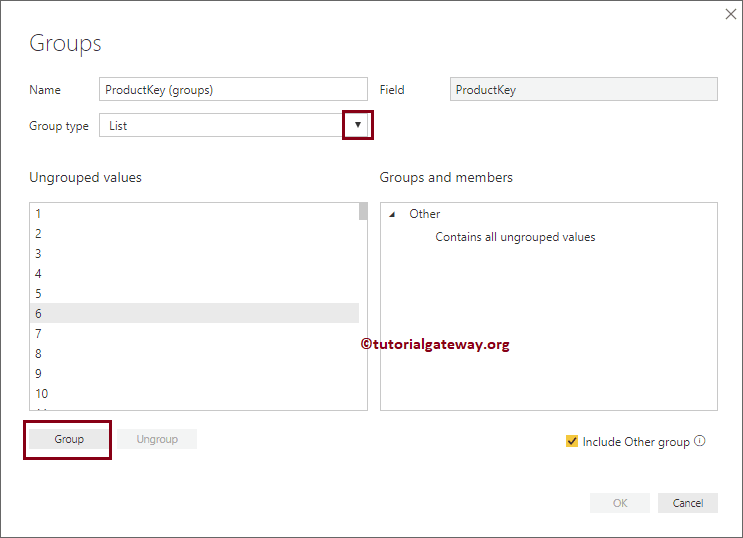 Select the New Group option from the context menu.